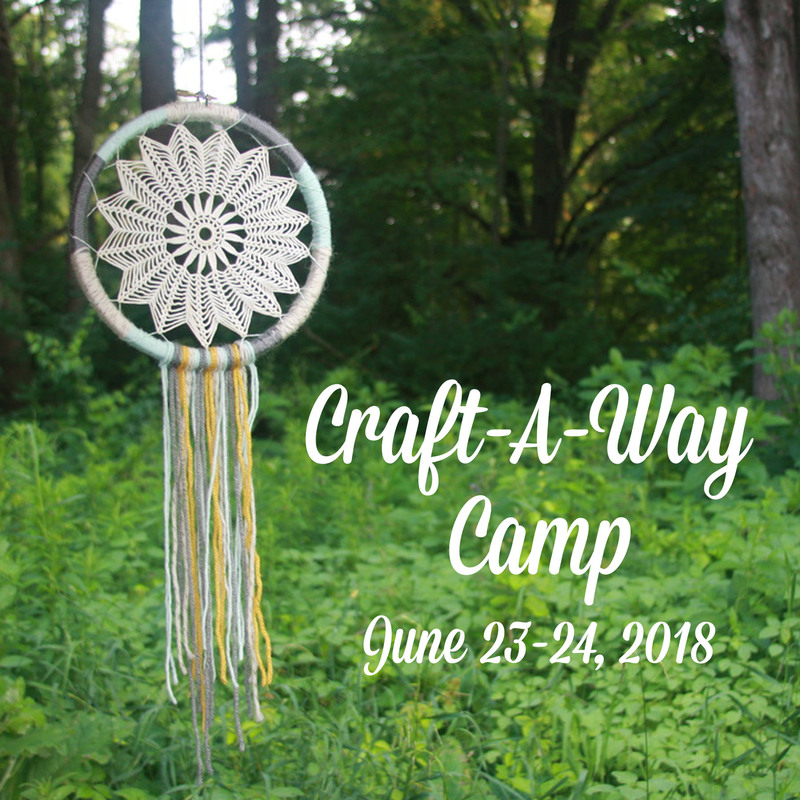 Small Craft | Hosting Craft-A-Way Camp, and monthly creative workshops. To children, the summer days seem to shine on forever, and camp seems like a timeless tradition. But Craft-A-Way has been a camp for adults. And as adults, we know that our time in the sun is limited. We know that a camp—like all our endeavors—is a struggle against time. After seven years and five Camps, the time has come to bid Craft-A-Way a fond farewell. We won’t be hosting a Camp this summer, and we don’t have any plans to do so in the future. Last year’s Camp – as rich in laughter, friendship, and creativity as those that came before – will be remembered as the finale. We’ll miss this annual gathering, and we know that many of you will too. But we’re glad that it could end on such a high note. Craft-A-Way began in a conversation with our friend Marcy: Wouldn’t it be great if we could spend some unhurried time connecting with the crafters we always see amid the bustle of a fair? It’s a conversation many have had over the years. What made this one different, is that we immediately got up and began striving to make the dream a reality. Craft-A-Way flowered into fun and relaxation, but only because its roots were fed by a lot of hard work. Today, we’re still working hard, but we’re not in a position to give Craft-A-Way Camp all the time and energy it requires. Our careers are becoming more demanding. Our children need guidance as they enter their teen years. And it’s becoming more and more clear that our time and energy are limited resources. For as long as we’ve had a family, we’ve been working to build Michigan’s indie craft scene. And for as long as Michigan has had an indie craft scene, our family has been a part of it! This community has been so good to us, and we like to think we’ve done it some good as well. We hope we’ll always keep that connection. But right now, our focus has to be elsewhere. Hard work is just one of the factors that made Craft-A-Way special. Another, of course, is magic. You’ll often hear our campers talk about the magic: Those moments when our everyday concerns would disappear, and all we would see around us was love, joy, and creativity. That kind of magic is rare and precious, and it may seem strange to leave a place where we’ve found it so often. But here’s the thing: Magic is one of those creatures that’s beautiful because it’s wild. You can’t teach it to come when you call. Efforts to tame or cage it are never anything but sad. All you can do is follow it where it roams. Small Craft has followed the magic down a lot of branching paths. It’s led us to sell upcycled craft supplies in a Flint Masonic Temple. To send a costumed gnome capering through an Ypsilanti brewery. To give away vegan donuts in an anarchist collective’s Woodbridge theater. All of these were great adventures. But if we’d lingered too long on any one, we never would have made our way to Camp. From the beginning, Craft-A-Way has been about building community. And in that regard, it’s been a great success. A close-knit group of regulars has formed and grown at Camp, bonding over handmade projects, potluck dishes, and inside jokes. These campers now gather for overnight craft parties throughout the year. There’s no doubt that this community will continue to thrive, even as Craft-A-Way comes to an end. If Craft-A-Way has a legacy, let it be this. Years from now, when Camp is just a fading memory, let Michigan still be known as a place where crafters share a true and fearless love. The Renegade Craft Fair is coming to Detroit. And it’s only right that the local craft community should ask: what is gained by this visit, and what is lost? The answers to this question will have important repercussions, not only for our community, but for others like it. As for Small Craft, we believe that the Renegade Craft Fair will take far more than it gives. We have a deep love for indie craft fairs, and a long track record of supporting them. But we’ll be staying far from this event, which does not seem to represent either the best interests of our community, or the values of indie craft as a whole. In 2017, the Renegade Craft Fair is a global chain. It has 12 locations in the U.S. and U.K., if we include unproven markets such as Detroit. And like any global chain, its stated goals include growth. “We look forward to expanding our reach to more cities,” reads a statement on the Renegade Craft Fair’s website. The logical conclusion to all this growth is that more fairs in more cities will be Renegade Craft Fairs, with the same name, the same logo, and the same ownership. The variety and opportunity of the indie craft scene will be exchanged for a single well-known and consistent global brand. This is a familiar model to all of us, easily seen in the repetitive strip malls that line the streets of America’s cities and suburbs. But it’s an awkward fit for the indie craft fair, which is intended to offer an alternative to all of that. It’s a thrill, to be part of such a moment. And that thrill remains a key part of the Renegade Craft Fair’s appeal. There’s a hint of it in the “Renegade” name. And in their website’s assurance that the fair is “continuously championing the global indie craft movement.” But today, Renegade is a large chain, expanding into communities that already have their own indie craft fairs. Does this encourage people to make for themselves? To create an independent economy? Does this champion a meaningful movement? In 2003, Renegade began with a few blankets on the ground, but was able to generate “exhilarating energy,” by offering something new. In 2017, it’s “the farthest reaching craft showcase in the world,” but does it still have that energy? Is it still an experience that people will look back on years later, with gratitude and wonder? We ask, because in Detroit, the Renegade Craft Fair doesn’t appear to be offering anything new. Instead, it seems to be reaching for a piece of what’s already been built. Detroit has indie craft fairs. Lots of indie craft fairs. And it has, for quite some time. The largest and longest running is the Detroit Urban Craft Fair, which will be celebrating its twelfth year this December. Over the years, it’s been joined by numerous others, each with its own particular focus and flavor. Local shop Detroit Mercantile hosts a Merry Market each holiday season. Ponyride is home to a Summer Series and a Holiday Market. Floral designers pot & box host a HLDYMRKT and a VLNTNSDYMRKT in the winter. And these are just a few examples. There are also indie craft fairs in the suburbs that surround Detroit, such as Ferndale’s DIY Street Fair. And in neighboring cities, such as Ypsilanti’s DIYPSI, Flint Handmade’s Craft Markets, or the Toledo Maker’s Mart. Each of these is its own unique and independent event. And each serves its own time and place. But loose connections have been made through the years, and a robust regional community has emerged. Local fair organizers are often crafters themselves, and they sell at one another’s events. One fair will use its social media to promote another. The calendar is shared, to avoid conflicts. Is there a sense of competition? Sure. But it’s balanced by a sense of community. Crafters have watched each other’s children grow up at these fairs. They’ve danced at each other’s weddings. They’ve mourned each other’s losses. And whether or not visitors to these fairs know all that backstory, they can still feel the warm glow of an authentic craft community. A global chain can’t replicate that, and it can’t offer anything better. Detroit also has many homegrown events that predate the arrival of indie craft, but similarly combine the bohemian, the handmade, and the festive. To choose one high-profile example: Cass Corridor street fair Dally in the Alley has welcomed artists and craft vendors throughout its 40-year history. When we participate in these events, we make ourselves part of a larger tradition. This is a famously resourceful and innovative region, home to a variety of thriving cultures. So there are many kinds of beautiful handicrafts to be found here. We love indie craft, but it’s important to remember: it’s just one tiny drop in a great river of creativity. And it’s impact is not entirely beneficial. If we step away from the indie craft fair, and walk around with open eyes, there’s no end to the incredible handmade work we’ll see. All of which leads to the question: what does the Renegade Craft Fair have to offer, that we do not already have in abundance? There is already a flourishing craft culture, in and around Detroit, and it includes a sizable network of indie craft fairs. So Renegade really is bringing us nothing new, in that regard. What it can offer, of course, is a nationally known brand. And it may be that this brand will draw more vendors from across the country. That’s not a bad thing. It’s always great to meet new crafters, and see new work. But it must be asked: If you’re on the road sharing your original vision, shouldn’t it be more of an adventure? Do you really want to find the same fair in every town? New experiences fuel the creative process, so it’s to everyone’s good if touring vendors continue to travel through a network of unique, local fairs. Indie culture far predates its association with the craft fair, and it has worked out a set of values in the smudged pages of countless zines, and the sweaty basements of countless shows. Craft, of course, is vastly older, and has had centuries to patch together its own set of values. Indie craft inherits the values of both parents, and makes them its own. In indie craft, we value the local gathering over the big box store. The imperfect original over the exact replica. Independent adventure over managed safety. The ultimate goal is a form of self-sufficiency, often summed up in three letters: DIY. Do it yourself, at every step, and on every level. At a good indie craft fair, those values resonate through every aspect of the event. And when an object, a vendor, a fair, and a community are all expressions of the same DIY ethos, it makes a powerful statement about the world where we want to live. By acting in accord with these values, indie craft roots itself in two strong legacies. And it assures itself a healthy future. For it’s these values that give indie craft a depth worthy of sustained exploration. With them, it offers a community where a good life can be lived. Without them, little more than a passing style. It would be painfully shortsighted, then, to cut ourselves off from those values, in support of a monolithic brand. In Handmade Nation, co-founder Sue Daly states that the Renegade Craft Fair began because she and a friend “thought it would be fun to throw an event that embodied the DIY spirit.” That was a beautiful goal then: one that inspired us all. It would be a beautiful goal now: one we’d be happy to support. But when a global chain disrupts a local community, where is the DIY spirit? Full disclosure: Small Craft’s Amy and Ethan Cronkite were organizers of the first Detroit Urban Craft Fair. Amy was a member of Handmade Detroit, the fair’s founding organization, and was an organizer for the first ten years of the event. She took a leave of absence in 2016, and announced a final but friendly departure from Handmade Detroit this year. This is a proud and important part of our history, but we’re no longer affiliated with Handmade Detroit or the Detroit Urban Craft Fair. First: We don’t pretend to be neutral observers. We’re longtime participants in the local craft community, and we love our local fairs. We want the community and its events to stay strong, healthy, and beautiful. And all our thinking is very much informed by that. Second: We aren’t speaking for any fair or its organizers. These are purely the views of our little family business. And while Small Craft hosts a variety of fun events, there’s one kind we don’t ever host: a craft fair. Because we know that niche has already been filled. We also think it’s important to acknowledge the Renegade Craft Fair’s past accomplishments. While history does not show Renegade to be the very first indie craft fair, as is often believed, it was certainly among the earliest. And we have a lot of respect and appreciation for that pioneering work. With one of her earlier craft ventures, Amy was a vendor at Renegade’s 2007 holiday fair in Chicago. And our family shopped at their summer fair in Chicago that same year. In those days, we felt a sense of shared purpose with the Renegade Craft Fair. That’s what makes its current approach so disappointing. Crafting with friends, in the beauty of the Michigan outdoors. If that sings to you, you’ll want to join us for a weekend at Craft-A-Way Camp. (And if that song’s not in your key, you still might want to join us! We have regulars who claim they aren’t crafty, or that they don’t like camping. But once they’ve visited, they keep coming back for more.) Our summer camp for grownups is back, June 24 and 25. It will feature a round of fun, new workshops. And a return to our old, familiar ways. Applications are due May 25, so be sure and get yours in soon! We’ve been gathering at the Lower Peninsula’s largest state park since 2013. And that’s given Craft-A-Way time and space to build up its own traditions, jokes, and culture. That all forms the ground beneath an experience that’s often described as “magical.” It’s that giddy moment when the outside world drops away, and the only priorities are making by hand, connecting with friends, and relaxing in nature. In this year’s workshops, we’ll try everything from screen printed t- shirts to ceramic talismans. We’ll explore Sashiko embroidery, and learn to make faux feathers. Between workshops, we’ll enjoy beloved camp crafts such as painted sticks and woven lanyards. Far from our cares and free from distractions, we’ll take a deep dive into the creative process. When the sun goes down, we’ll gather around the campfire, to play music and roast marshmallows. And at the end of the night, we’ll sleep in a pair of rustic bunkhouses. It’s the camp experience you remember, and it still has the same power to build a warm and supportive community. Last year was a dark time for our family, and we were forced to take a hiatus from Craft-A-Way Camp. This year has been a dark time for the nation as a whole, and there’s an especially urgent need for nourishing traditions. Now more than ever, we all must affirm our commitment to wilderness, creativity, and community. We’re glad we can return at this challenging juncture, and welcome you to Camp. We remember when Detroit had no indie craft fairs. And we remember the excitement when the first one opened its doors. For us, as for many others, that moment set our life on a new course. So we’re proud to be a part of the Detroit Urban Craft Fair’s 10th Anniversary Party and Preview! On Friday, December 4, from 6 to 9 pm, you’ll find us at the Masonic Temple, offering a free make and take project. Michigan’s largest and longest-running indie craft fair will be in full swing, with more than 100 vendors, plus all sorts of opening night festivities. And we’ll have all the tools, materials, and instruction needed to make a necklace inspired by Craft-A-Way Camp! Enjoy an early look at the craft fair, learn about next summer’s camp, and take home your own handmade creation. Having experienced DUCF’s rise from strange new idea to beloved annual tradition, we know how much can be accomplished through constant effort and careful planning. So when we found ourselves dreaming of a summer craft camp for adults, we started working to make it a reality. We’re now looking back at three seasons of Craft-A-Way Camp, and preparing for a fourth. And it’s every bit as fun as we’d imagined! Every summer, crafters from around the Midwest gather in the Michigan woods for a weekend of campfire singalongs, nature hikes, and outdoor crafting. If that sounds like something you’d like to be a part of, you’ll want to stop by our table at the Detroit Urban Craft Fair for more information! This year’s DUCF is a three-day extravaganza, starting Friday, December 4; and continuing Saturday, December 5; and Sunday, December 6. Friday night is a special party, offering early access to the handmade goods, and raising funds for local nonprofit Living Arts. The party will feature hands-on activities, including a make and take with floral designers pot & box. (Creators of the amazing Flower House, and hosts of our February 2013 get-together!) At our Craft-A-Way table, campers will be sharing memories and answering questions. Save-the-date postcards will be available. (Our fourth annual camp will take place June 25 – 26.) And you’ll have the opportunity to try your hand at a jewelry-making project from a past summer. The bead necklace workshop was a highlight of our first Craft-A-Way Camp, in 2013. Led by jeweler Courtney Fischer, it had all the hallmarks of a classic Craft-A-Way project. It was simple enough to be easily completed while laughing with friends and enjoying a cold beer. Yet it resulted in beautiful jewelry, that our campers continue to wear proudly. And in the contrast between vivid paint and natural wood, the necklaces reflect the experience of crafting in the outdoors. There’s no better way to understand Craft-A-Way Camp than to pause and make something by hand. So we hope you’ll take a moment to visit with us and paint some beads. Detroit had a storied tradition of creative innovation and DIY community, long before the first DUCF. But it was not yet plugged into the network of indie craft fairs that had begun spreading through the nation’s cities. Small Craft’s Amy Cronkite was one of a small group of women who planned and implemented the first Detroit Urban Craft Fair. And as a partner in Handmade Detroit, she’s worked to keep it growing and thriving through the years. If there’s one visionary who brought that group together, it’s Stephanie Tardy Duimstra. We had just recently moved to the area, and knew few people here, when Stephanie reached out and invited Amy to participate in planning the first DUCF. That warm, welcoming gesture brought us into the community. It made all the projects we’ve done here possible. And it’s a great example of indie craft culture at its best. Stephanie still sells at DUCF, under the name Type Shy. We’ll be stopping by her table to shop for beautiful handmade paper goods, and to thank Stephanie for all she’s done. We encourage you to do the same! Our daughter has never known a time without the Detroit Urban Craft Fair. We attended the fair’s first planning meeting just five days before she was born. At the inaugural DUCF, she was a seven month-old baby in our arms. At the most recent fair, she was a vendor, selling her own line of handmade goods. She’s growing up in a world where a market’s been built for her wildest notions. Where a community rallies to support her goals. Where honest work can bring her dreams into the daylight. In these and other ways, it’s a better world than the one we inherited. We can’t wait to see what she makes of it.